Update installed, will advise if this fixes the problem. It has rained today, so I will check after midnight. Downloaded and running. Haven't had any rain so far today. I'm afraid that had no effect. 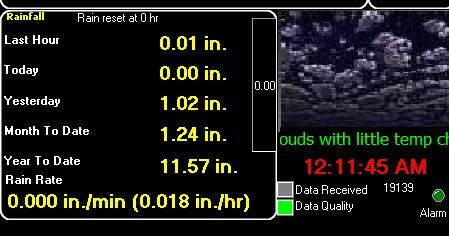 Editing the rain for 00:00:00 timestamp to 0.00 corrects the totals shown by MT. so maybe I need to not send around that midnight time change instead of local midnight time change? UTC midnight would be 8 PM my time. Not sure that would have any effect. Appreciate the attempt. I have escalated this to Jachym with links to this thread, plus on MT forum. I was going to text Jachym to see if he was still working on the project or not. I may still, to let him know there is interest in continuing on with this being resolved. This has felt like a timing issue, but now I am not sure. I have WD's API updater sending data every 3 seconds. To further trouble shoot, I have changed that to 1 minute intervals, and 5 minute intervals on days it has rained. The same problem exists, the 00:00:00 entry in the MT database for the next day includes the rain total from the previous day, but the 00:00:05 does not. However that 00:00:00 entry throws totals off until corrected. Fortunately Jachym has made it easy to edit the SQL database on the server. I'll get those updated files installed, and let you know the results. Probably won't be until this weekend based on the forecast. OK, got to admit I am confused now. I installed the latest from the test.zip you provided. First image shows the correct rain totals for yesterday, month, and year. The next image is the rain block on MT. 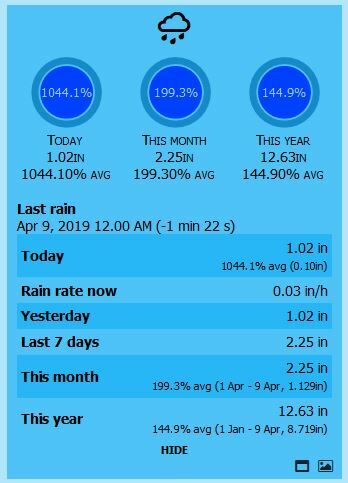 The rain total for today is 0.00, but the month and year totals are incorrect as the rain yesterday is added twice. The last image shows the MT database for the first entry for today. And the final image shows the MT block, after the 00:00:00 rain amount is corrected.